The Tempcore process is widely accepted as the best process for production of high quality rebars since the technology uses low cost raw materials against costly alloy elements but results in the same high mechanical properties ensuring excellent weldability, ductility and bendability a notable saving in alloy cost per ton. The process involves heating of steel billets in a Reheating furnace and rolling them through a sequence of rolling stands which progressively reduce the billet to the final size and shape of the reinforcing bar. As the bars leave the final mill stand, they are submitted to a special heat treatment involving three stages. Raw material yard - In this section we maintain proper stock and sort them according to size. We then sample it for chemical testing as per IS:1786. Pusher - Chemically OK & tested raw material comes to pusher & pushed into the re-heating furnace. Re-heating furnace - Raw material is heated up to 1200(+/-50)degree ceg. So that it becomes ready for hot rolling. 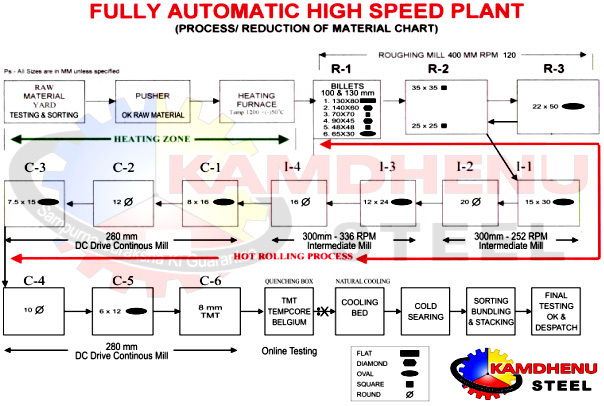 Roughing mill - Properly heated raw material first enters into roughing mill and is rolled into different shapes. From here we can get 25 mm tmt bars. Intermediate mill - After getting finished by roughing mill raw material comes into intermediate mill & from here we get 20 mm & 16 mm tmt bars. Continuous mill - From this section of RMD(rolling mill division) we get 12 mm tmt bars. DC drive continuous mill - At last, this section gives us 10 mm & 8 mm tmt bars. Quenching box - We have an advanced technology of TEMPCORE from Belgium. When bar enters this quenching box, it comes in contact with continuous high pressure and flow of water which hardens the outer surface of bar while the inner core remains soft. Cooling bed - After passing through Quenching box , bars are laid down on cooling bed where natural cooling of bars occur. Cold shearing - At this shearing machine we can cut the required length of tmt bars, before sending for bundling to yard section. At last, samples are collected for final testing. Ok & tested finished goods are now bundled & dispatched.